New from Alinco is the DJ-G7T Triple-Band Transceiver. It works on 2m , 70cm and 23cm bands. 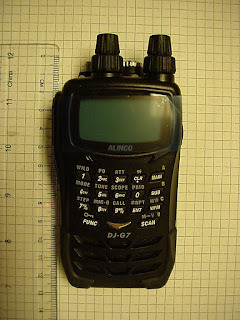 It can receive from 531Khz-1300Mhz in AM/FM and WFM. Some features: Rain proof (not water proof), true dual-band receive, Li-Ion battery, other then that it has what you might expect from your typical hand-held radio.